Having your own dehydrator for jerky allows you to make delicious, inexpensive high-quality beef jerky at home. These machines include special drying chambers that are gently heated while a powerful fan moves air over your food, resulting in drying times of mere minutes. 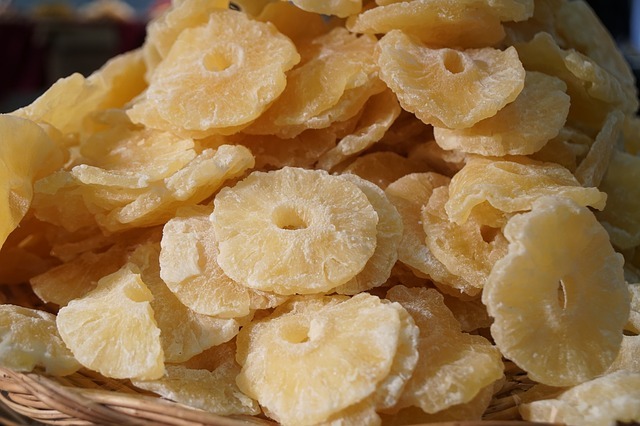 Luckily for your snack plans, dehydrators are reasonably budget friendly and incredibly easy to use. They can be used to dry jerky, fruit, spices, and more, giving you lots of delicious new options in the kitchen. Sound good? Here are a few of the best dehydrators on the market. We’ll delve into the details of these powerful units so that you can decide which combination of price, performance, and features works best in your kitchen. Want to know which meat dehydrator to choose? Read on and find out! The Presto 06300 offers basic dehydrator functionality at an incredibly low price. It’s one of the cheapest units around, period, and it’s got plenty of power and space for casual use. On their own, either of these two factors would make the Presto 06300 an acceptable choice. In tandem, they make it a strong contender for best home dehydrator machine. 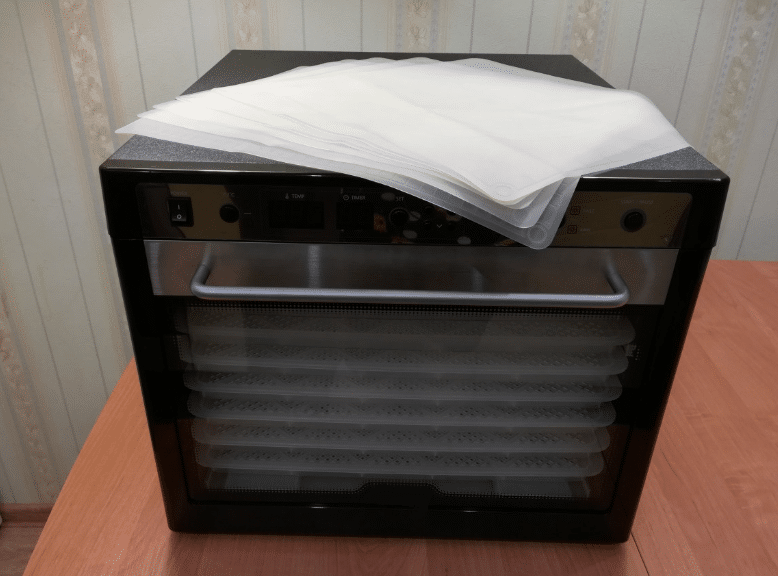 Admittedly, this Presto dehydrator is a little bit on the smaller end when it comes to raw out-of-the-box drying area. It includes 4 trays, each with a 12” diameter work surface, that you can use all at once. For a bit of casual jerky making, but you’ll struggle to process large quantities of oddly shaped food. You can purchase four additional trays to use with the machine, doubling its capacity, but at some point you’re probably better off just buying a bigger dehydrator. Unlike some other units, the Presto 06300 uses a simple on/off switch to control the machine. It’s got a heating element with exactly one setting, 165 F, and a simple fan that both sit below all of the active trays. 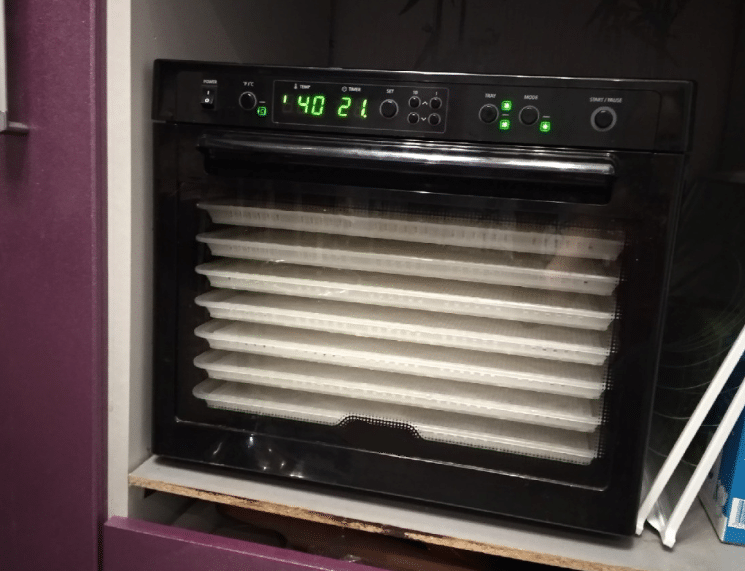 Simple physics and smart design ensure adequate airflow to dry food without any work on your part. The simplicity and cost-saving design of the 06300 comes with two major downsides. First, it doesn’t dry particularly fast. I’m not sure whether this is because of heat, airflow, or both, but food seems like it takes longer in the 06300. Once you’ve dried a particular food in this machine you’ll know about how long things will take, so you can just set a timer, but you’ll definitely want a different unit if you want to crank out back-to-back batches of jerky in a small timeframe. Second, the trays included with the 06300 are fairly bare-bones. You can purchase upgraded trays with special sheets for fruit rolls or tighter screens for smaller food, but you will need to spend extra money. Again, the primary advantage of this unit is the low cost, so at some point you should consider simply purchasing a pricier dehydrator instead of upgrading this one. As far as upsides, the biggest one is evenness. This dehydrator does an excellent job drying food on every tray at just about the same rate. If one piece of food is drying out faster than another, the culprit is almost certainly the food itself, not the dehydrator. This is a feature that’s incredibly handy when you’re drying a batch of banana chips for several hours – you don’t have to rotate trays or flip the chips over. Overall, the low cost of the Presto 06300 makes it an excellent choice if you’re looking to get started with jerky making or dehydrating other foods on a budget. 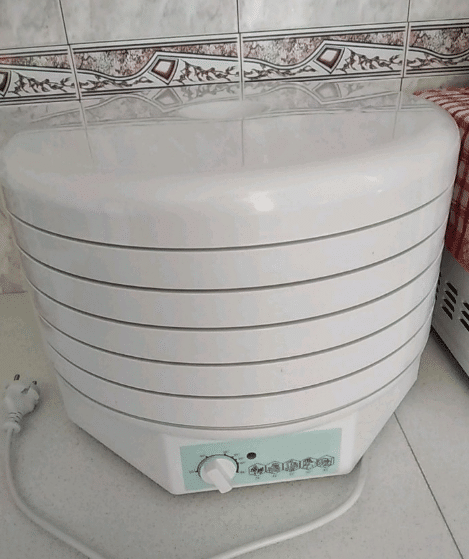 It’s not the fanciest or fastest electric dehydrator around, but it definitely gets the job done. As long as it remains cheaper than other options, it’s definitely worth considering for your kitchen. The NESCO FD-75A offers a handful of small upgrades over the inexpensive Presto above. With more trays, an adjustable heating element, and a comparable fan system, you can dehydrate more food at once with more control. These features make it perfect for any household that wants to get a little bit more serious about dehydrating. Part of what makes the FD-75A such a nice upgrade is the quality of the dehydrated foods themselves. It produces incredibly evenly dried food after a handful of hours. All of Nesco’s dehydrators tend to score excellently on every sort of benchmark, and the FD-75A is no exception. Like the Presto above, this Nesco dehydrator lacks any sort of an internal timer. This isn’t a big deal for most folks – typical dehydrator usage is on a scale of several hours and involves checking your food for doneness a couple of times, so you’re not going to trust the machine to turn itself off in any case. It is, however, a mild inconvenience if you want to leave the dehydrator on before you go to bed. You might forget to turn it off in the morning! The slight increase in usable surface area from the Presto to the Nesco is honestly not noticeable under most circumstances. It’s something like a 20% increase, which means you can make a more at once, sure, but in my experience you’ll wind up drying the same number of batches. It’s a nice upgrade, to be sure, but it’s not likely to be incredibly significant. The much more obvious upgrade comes from the temperature control. The FD-75A has quite a few dial settings that you can use to accurately dehydrate different types of food at different temperatures. This ensures that your food ends up with the amount of moisture you want while maintaining the right texture. You don’t want tough, dry jerky. Controlling an extra variable (temperature) can help ensure that your recipes turn out great. Like most other consumer dehydrators, the loudest part of the Nesco is its built-in fan. The electric heating element is nearly silent, making the entire unit quieter than the vent fan on most microwaves. It’s not something that’s going to disturb the other residents in your house with loud noises. That said, it is worth mentioning that these dehydrators do cause some fairly powerful odors. The smells they produce are pretty similar to the smells you would expect if you put the food you were drying into the oven, except they often seem stronger. This is because dehydrators work by blowing hot air over your food. After the air is done passing over your food, it then enters your home and makes the whole place smell like jerky (or herbs or whatever it is you’re dehydrating). Again, the Nesco FD-75A is not particularly better or worse in this aspect when compared to other dehydrators. You can alleviate the smell’s impact by opening some windows, turning on your kitchen vents, and cleaning the dehydrator trays thoroughly between uses. They won’t retain smells, enabling you to dry garlic and fruits in alternating sessions with no cross-contamination of flavors. While this Nesco dehydrator doesn’t come with special trays for fruit rolls or small foods, it does come with a set of four inserts that you can use. Two of these inserts convert trays for fruit rolls, while the other two simply prevent extra small food from falling through the cracks. You don’t have to pay any extra for these screens – they just come in the box. Overall, the Nesco FD-75A is a nice, solid upgrade over the Presto 06300 above. It’s fairly affordable, has plenty of room for most home users, and comes with everything you need for multiple types of dehydrated foods right out of the box. Most importantly, however, the temperature control adds a much-needed axis of control that helps you to control the exact texture and moisture content of the foods you dry. For those who dry food more regularly, the Gourmia GFD1950 offers more convenience. With 9 pull out trays, adjustable drying temperature, and a built-in timer, it’s a great way to make the process of drying food simpler and easier. Like the Nesco above, this electric food dehydrator features a controllable thermostat so you can change how hot things are as your food dries. Any food you put inside the dehydrator will be carefully heated to a temperature from just under 100 F to just under 160 F while fans circulate plenty of dry air. This process quickly removes moisture from your food, turning your prepared meat into jerky, your delicate herbs into dried seasonings that can last for weeks, and your fruit into delicious, crunchy snacks. The Gourmia isn’t just a square version of the Nesco, however. It includes critical unique features, like an auto shut-off timer. When you dehydrate food, your cook times often are measured in hours, not minutes. 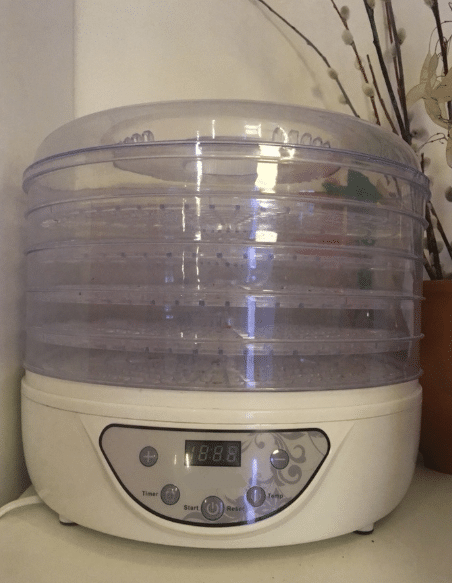 The ability to set up your dehydrator overnight and have it shut itself off automatically in the morning is invaluable for people with busy schedules. Admittedly, most dehydrator recipes involve more of a time range than an exact value. You’ll probably still be checking back once or twice to see if your food has reached the proper moisture level and texture. The Gourmia actually includes an incredibly helpful set of features that make this easy. The front door is transparent and incredibly easy to remove. This means you can check your food with a glance. Should you want more tactile feedback, the stacked trays are removed horizontally, not vertically, so it’s easy to access food placed on any level. Another big advantage of the Gourmia is its size. With nine stacked trays that are all roughly the same size as the Nesco or Presto trays, the Gourmia gives you an incredibly large amount of surface area to dry food on. It even has the option to arrange your food vertically, from hooks, instead of laid out flat on trays. This makes it a great upgrade for people who find themselves drying out lots of food at once. One final advantage comes from the extra-quiet fans. All dehydrators work by forcing dry air over food at warm temperatures, which means that every dehydrator has to have at least one fan to move air. Gourmia’s unit uses a system of multiple fans that somehow produce noticeably less noise than competing units. Dehydrators generally aren’t super loud to begin with, so this means that this Gourmia dehydrator is exceptionally quiet. 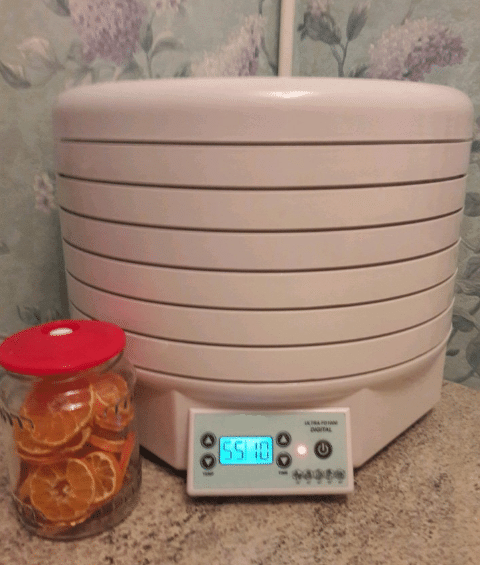 While it’s pricier than the units above, I think that the extra advantages offered by the Gourmia GFD1950 make it worth considering for anyone who thinks they’ll use their dehydrator a lot. More space, less noise, more advanced controls, and easier access to food make it a large step up from the models above. It’s more expensive, sure, but the extra convenience is more than worth it. This 9-tray dehydrator is suspiciously similar to the Gourmia unit above. It’s got a nearly identical form factor, extremely similar specs, and even similar marketing materials. As you might imagine, a set of similar internals ensures that both machines deliver similar performance. In fact, other than cost, it’s effectively the same machine. Personally, I think that Gourmia is a slightly more reliable brand than Magic Mill, but that’s because I’ve got a pleasant history of using Gourmia devices in my own kitchen. This means that with all other factors being equal, I would prefer the Gourmia for myself. In your kitchen, however, you’re free to choose either unit based on the incredibly minor differences in appearance, your own brand preference, or the online sale price of either machine. They tend to be somewhat comparable in price, but one is often at least a few dollars less than the other. 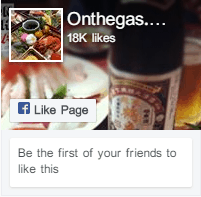 Feature wise, simply refer to the Gourmia review above. These are pretty much the same machine. This MAGIC MILL simply gives you an additional option to consider to save a few dollars. Overall, I would strongly recommend this MAGIC MILL dehydrator over the Gourmia above, but only if it’s on sale for a lower price. Otherwise, I’d stick to the mostly-identical Gourmia. Both machines boast excellent capacity, built-in timers, easy access to food, and adjustable temperatures. No matter which one you choose, you’ll love the homemade jerky and dried foods that you can create. Slice beef into thin pieces. 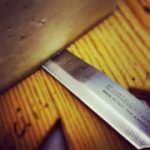 If possible, try to ensure that the grain is perpendicular to the long axis of each piece (so that you can chew against the grain). Marinate beef for several hours, up to a day. 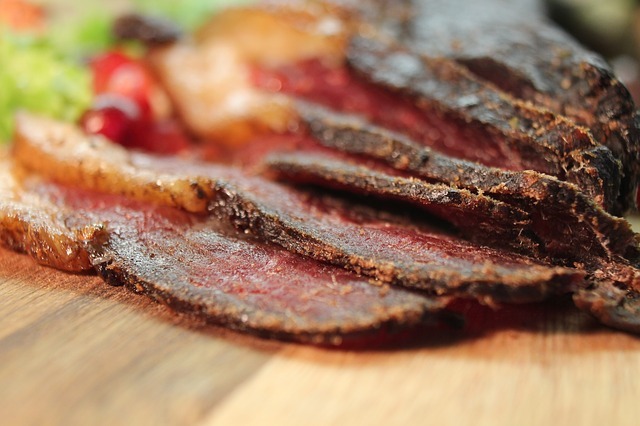 Place beef slices in dehydrator and dehydrate until quite dry, usually about three hours. This basic framework is quite effective. It does three important things: it ensures that the beef feels tender when you chew it (due to the grain’s orientation), it flavors the beef (with the marinade), and it helps ensure that the not-quite-cooked beef that you eat is reasonably safe. This is because the salt and acid in your marinade fight off bacteria, even as they chemically tenderize your meat. The easiest part of this recipe to play with is the marinade. As long as you include salt and a bit of acid (like vinegar) you’re free to put pretty much whatever you want into your flavoring solution. This might include sweet flavors, like barbecue sauce, honey, or teriyaki, spicy flavors like peppers or garlic, or savory flavors like soy sauce, Worcestershire sauce, or fish sauce. For a more complex flavor, consider adding a drop or two of liquid smoke for an outdoor barbecue feel. If you’d like some inspiration in the marinade department, try checking out your favorite artisanal jerky shop. They’ll have lots of interesting flavor ideas, ranging from ginger and maple to crazy hot peppers. Try incorporating some of these flavors into your own jerky and see what you think! While you might think that simple is better, with jerky, you really don’t want to skimp out on the marinade. 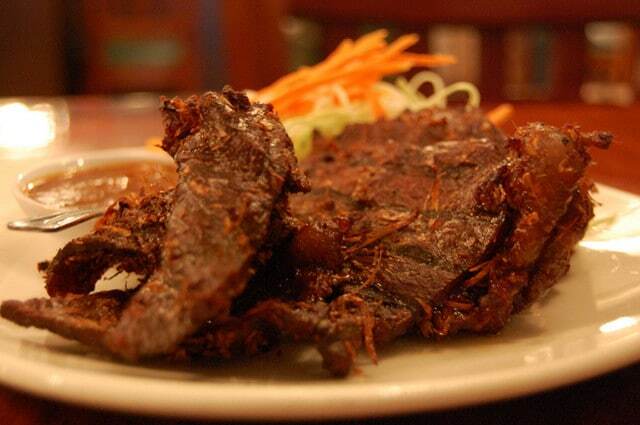 Bold blends of boisterous flavors usually don’t overpower the natural beefy taste of the meat. Instead, they bolster it by giving the meat flavors a platform to stand on. There’s nothing wrong with sticking to simpler marinades if that’s what you prefer, but don’t omit this important step entirely! Your beef won’t taste anywhere near as tender or delicious. 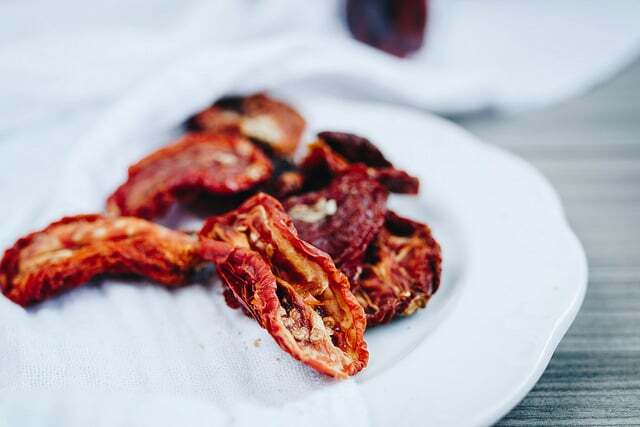 If you’d like to enjoy delicious homemade jerky, having your own dehydrator allows you to make this delicious snack quickly and easily. The Presto 06300 offers a brilliant blend of functionality and cost, giving consumers an affordable machine that still makes excellent jerky, while the Gourmia GFD1950 and Nesco FD-75A offer more options and features for more serious enthusiasts. All three of these machines produce even heat and offer plenty of airflow, allowing you to make delicious jerky in your kitchen in just a few hours with very little work. All you have to do is slice beef, marinade it, and throw it in!